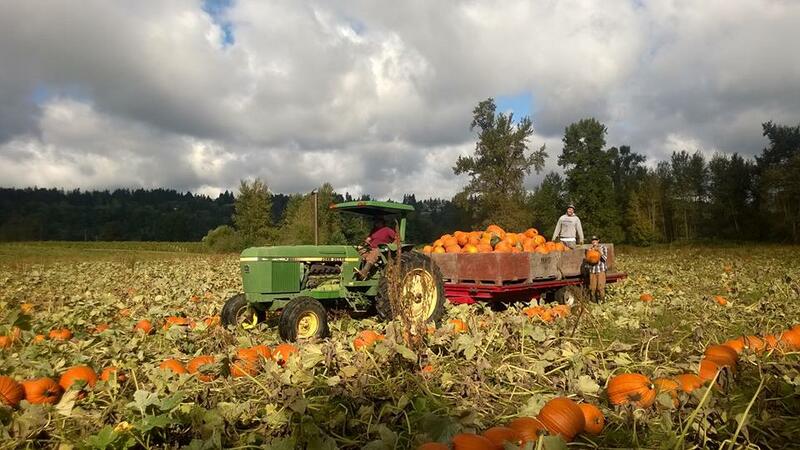 A celebrated Northwest tradition, farms throughout Pierce County offer a variety of pumpkin patch and corn maze experiences that are sure to delight the whole family, and Puyallup in particular has a whole host of fall fun to enjoy. Picha Farms’ pumpkin patch season runs from September 30 to October 31. This River Road farm serves up fall fun in the form of hay rides, a pumpkin slingshot with a 15-pounds pumpkin prize, and a five-acre corn maze with eight trivia questions along the way. Past years have also featured live music acts on the weekends. Bonus – dogs can join in the fun as long as they are on a leash. For more updates, find them on Facebook or visit the farm at 6502 52nd Street E in Puyallup. Spooner Farms may be best known for their sweet berries, but come October they get all decked out for fall. This year, the sixth generation farmers will hold their 24th Annual Harvest Festival from September 29 – October 31. The festival will feature 50 varieties of squash and gourds, along with activities from face painting to pumpkin slingshots to pony rides. You can also get your fill of fall snacks in the form of caramel apples, caramel popcorn, and roasted corn (weekends only). In addition to their annual pumpkin patch and Harvest Festival, Spooner Farms features a five-acre corn maze with over three miles of trails to wind through. This years’ theme is Destination Earth: An Interstellar Space Odyssey. For more information on the festivities, check out their website, Facebook, or visit them at 9710 State Route 162 E in Puyallup. Boasting a five-acre corn maze and the “largest pumpkin patch in the valley,” Double R Farms in Puyallup is chock full of family fun. After picking out your perfect carving pumpkin, be sure to jump on a free tractor pulled hay rides, available on the weekends. You can also launch two pumpkins for a dollar with their pumpkin slingshot. Sip on a beverage in the Pumpkin Barn and enjoy concessions starting the second week of October. Cornstalks are also available for purchase at three for one dollar. More details are available on their website and Facebook page. The farm is located at 5820 44th Street E in Puyallup. Located off Highway 410, Scholz Farm and Garden is a great location for fall family fun. This year marks the 40th anniversary of their Pumpkin Palace, featuring a u-pick pumpkin patch and a variety of squashes and gourds. The third generation farm, which is committed to natural, low-impact farming techniques, also offers the chance to check out antique equipment and sells jams, jellies, and other pickled products made straight from farm to table. For information on pumpkin season and the latest updates on their fall crops, follow them on Facebook. The farm is located at 14310 128th Street E in Puyallup.